There are 14 posts filed in Politics (this is page 1 of 2). Some people have been asking why Trump’s recent “Muslim ban” only includes certain countries. A fair question. Other people, like David Frum at The Atlantic, pointed how if this is meant to deter radial Islamic terrorism, then it’s a highly ineffective ban. Why did the Trump administration choose these 7 countries? The countries in question, for reference: Syria, Iraq, Iran, Sudan, Libya, Somalia, and Yemen. If you’ve paid really close attention to the news over the past couple of years, and have a good memory, you’ll recognize that those countries have been grouped together before. The Obama administration singled them out for travel restrictions. So if you’re asking why Trump picked those 7 countries for his ban: Trump didn’t pick them. All Trump did was take an already-existing list and expand on the restrictions. If the recent immigration ban ends up as a court case, you can bet that the Trump administration will try to cite the previous administration’s actions as precedent. Should We Do Away With The Electoral College? In the wake of 2016’s U.S. presidential election, some people are claiming that the Electoral College is obsolete and unfair. There are a couple of petitions circulating, along with miscellaneous talk on social media, about doing away with the Electoral College. Some people now believe that only the popular vote should matter. Most don’t know what the Electoral College even is, or why it might be important. Many complaints are reactionary in nature. Not understanding how elections work has left a large number of people confused, scared, and/or angry. I don’t blame them, simply because of the education system here in the United States. A lot of facts aren’t being taught. For example: Only 36 percent of Americans can name the three branches of government. The United States also isn’t a pure democracy. It’s categorized as a democratic republic, federal republic, or constitutional republic with a representative democracy. Here’s a 5-minute explainer on the Electoral College. In short, Americans vote for a vote; the system has good and bad aspects, but viable alternatives haven’t been seriously discussed on a national level. A short video from Praeger University says the Electoral College accomplishes three major things: it protects against mob rule, encourages coalition-building, and helps protect against voter fraud. 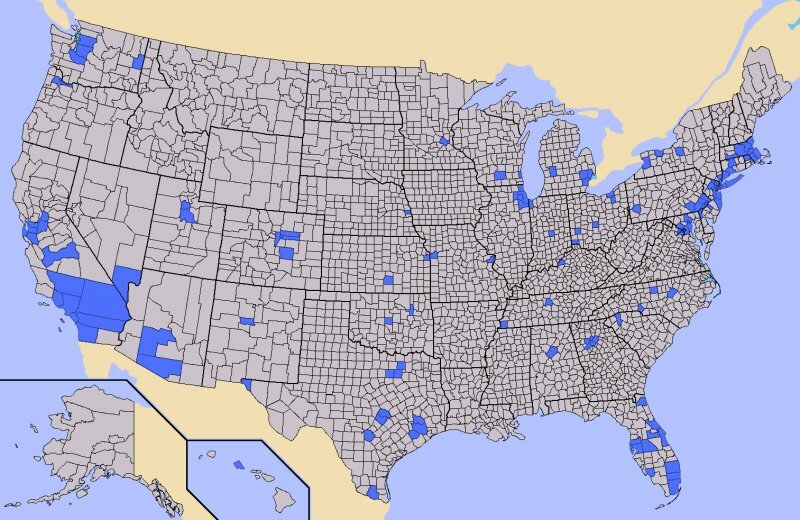 Those shaded-in-purple counties are where half of the United States lives. The urban-rural divide will likely increase over time, too. The Electoral College ensures that every state has a say in who gets to be President. It wouldn’t be fair if only 3 states controlled who governs all 50 states. If you’re campaigning for election, you should bring together people from all walks of life – not just metropolitan areas. Removing the electoral college would give major cities more power while taking away power from people who don’t live in cities. One of the biggest problems with the American voting system is Americans themselves. In the past 100 years (1916-2016) the voter turnout never went above 64 percent. After the attempted coup in Turkey, beginning late on July 15th, president Recep Erdogan has begun purging the system. Over 50,000 people have been fired, suspended, or detained. While the purge is guaranteed to continue due to Erdogan’s religious and political motivations, it’s not clear when he’ll stop. The BBC doesn’t believe there will be martial law, curfews, or some other potential actions. Political scientist Soner Cagaptay writes that Turkey “will be less free and less democratic” following the coup attempt. He, along with others, felt a coup was coming. Turkey has a history of coup attempts, some successful. Trump running unopposed. Clinton and Sanders still fighting for their nomination. This week, Ted Cruz dropped out of the race. (May 3rd) The very next day, John Kasich suspended his campaign in a last-minute decision. (May 4th) Both were disappointed by the results coming out of Indiana’s primary. Neither had any mathematical chance of securing enough delegates to become the Republican nominee. This leaves Donald Trump as the last man standing on the Republican side. Originally given a 1% chance at securing the nomination, he somehow defeated 16 other Republicans and now has a 99% chance of being the nominee. After all, he’s running unopposed. Who’s going to beat him? Bernie Sanders and Hillary Clinton are both a ways off from securing the Democrat nomination. In today’s news people are laughing about how “Trump’s kids aren’t able to vote for him.” I don’t think many people know how strange New York’s laws can be. Apple vs the FBI: the end? Yesterday the FBI withdrew from their fight. The FBI’s entire argument was that they couldn’t break into the iPhone. They argued that Apple had to be forced to write unique code to open their own product. From what I saw, few experts believed the government. The skeptics were right all along.